Now that Halloween has come and gone, it’s totally acceptable to start thinking about the holidays. Sure, Thanksgiving is a big deal, but we all know that Christmas is what people are really talking about when they refer to “the holidays.” Heck, it doesn’t even matter if you actually celebrate the religious part or not; Christmas is just a BIG deal here in the states. For some, this means mistletoe, Elf on the Shelf, and delicious food. For others, though, the thought of Christmas brings with it mind-melting anxiety. This may be because you have to deal with family drama, packed airports, or stir-crazy kiddos. Or, you may just be seriously stressing out on how you are going to possibly afford gifts for your family and loved ones. 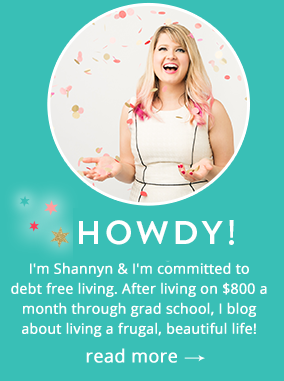 Well, have no fear, as Auntie Shannyn is here to relieve those worries, once and for all. If there is one thing I know, it’s how to buy quality with very little quantity (eh-hem, read: MONEY). So, without further ado, here are 6 easy ways to save money on holiday gifts……. No matter what you can or cannot spend, you won’t hit your mark without a plan. SunTrust OnUp provides an easy to follow Budget Worksheet that will help you start your season off right! You can also plan out the entire season with their Holiday Guide to plan out a creative and meaningful holiday season- no matter what amount you’ve set in your budget. You’ll want to take into account all the expenses you’ll encur- from air travel, pet boarding, office parties, ugly sweater parties, new holiday decorations, charitable gifts, not just gifts. Knowing all the small expenses that sneak up on you can help you better set a realistic amount for gifts, without getting stressed as the month rolls by. When looking for the best deal on Amazon for specific items on a loved one’s wishlist, I like to utilize CamelCamelCamel (or C³, as I prefer to call it). C³ allows you to create price alerts on Amazon items and will notify you when it reaches your preferred price. I can’t tell you how many great deals I’ve scored thanks to good ol’ C³! No one ever said your gifts have to be brand spankin’ new. The age old adage what they don’t know won’t kill them certainly applies here. So go out and rummage through thrift stores, garage sales, and antique shops! And feel ok buying off of eBay, Craigslist, or a Facebook swap and shop group. Seriously, y’all, they’ll never know! Plus, buying used is good for the environment, so consider it a nice gift for Mother Earth, too. Making your own gifts is a fantastic way to save money, and you really don’t need to be Martha Stewart to be successful. My biggest recommendation when going this route is to utilize your strengths. If you are a skilled photographer, frame a special print for them. If you are a killer cook, bake them some treats or give them a coupon for one homemade meal per month. A scrapbook is always super appreciated, as is a crocheted scarf or knitted hat. Or, offer to pet or baby sit for them. Of course, if you are still lacking inspiration, hop on over to Pinterest for about a million more ideas. Literally. Not only does this teach your kids about the more important things in life, but it can drastically cut down on your spending. This is especially true if you utilize some of the other tips I listed above. If you have a large family or group of friends, picking names is always a thrifty way to handle gift-giving. In a nutshell, everyone puts their name in a hat and then each person picks a name. You are then in charge of getting a gift for that person and that person only. If you decide to pick names, be sure that everyone agrees on a budget. Take it from me, it is a little embarrassing when one person spends $20 and the other $200. Sticking to a budget makes the experience special for everyone. 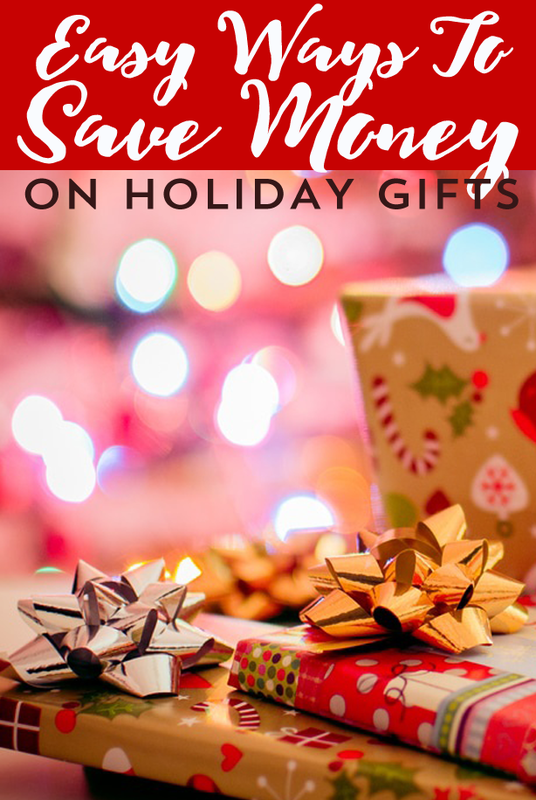 Well, my dears, I’m hopeful that these six tips on how to save money on holiday gifts helps relieve some of the anxiety you’re feeling. Remember, Christmas is really about love and friendship. Try to remember that if things start to feel overwhelming. It helps, I promise.